Its Sketchy Thursday at Scraptastic so I am sharing a new sketch. Visit the Scraptastic blog HERE to see more pages created by the talented Design Team. Here is my example layout using the We are Family Kit and Add on kit. I also have used the "remember this moment" stamp from the We are family stamp set and the Camera and heart stamp from the "Everybody Talks" stamp set. Another great sketch and love your page using it, as always! 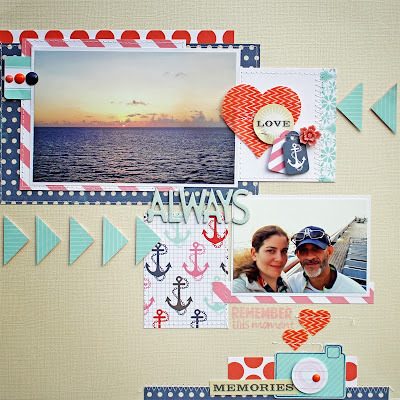 The hearts are perfect for this nautical scene! Wonder sketch and amazing color pallet! I am going to give the sketch a try! Love it! A simple sketch that will help me get a picture scrapped. Gotta do it!